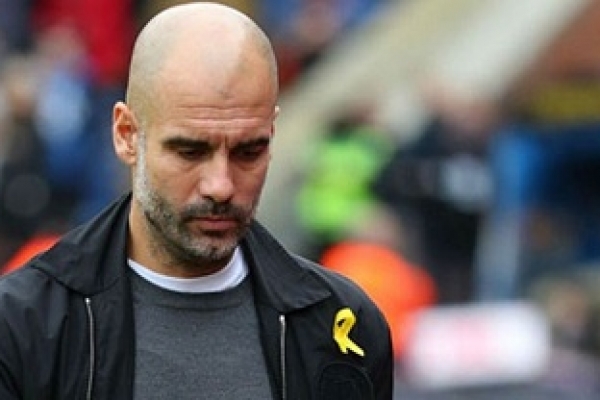 Pep Guardiola, Spanish professional football coach and former player who is the current manager of Manchester City, has been fined £20,000 and warned as to his future conduct for wearing a yellow ribbon on the sidelines. The Manchester City boss had been wearing the ribbon to press conferences and on the touchline, as a show of support for four Catalan politicians who have been imprisoned. The issue has been a source of contention, with Guardiola, who was born in Catalonia, arguing that the symbol is not political. However, the City boss has accepted that the ribbon breaches the FA regulations and will stop wearing it during games in order to observe the rules. Guardiola will continue to wear the ribbon for pre and post-match media commitments, as is permitted, with the FA's kit and advertising regulations referring specifically to the technical area during games. He can also wear it during Champions League matches, as he did for Wednesday's game against Basel, because it is not a breach of UEFA codes. Guardiola started wearing the ribbon last autumn following October's independence referendum in Catalonia, which was declared illegal by Spain. He was charged after last month's FA Cup loss at Wigan and since then he has either not worn the ribbon or covered it up while on the touchline. Speaking on Tuesday, Guardiola said: "I accept the decision because I have to do but that doesn't mean I agree or not, or they are right or not. "I am here, I am working here, and there are rules and I accept them. "I said from the beginning if the FA considers I shouldn't wear the yellow ribbon I would accept it but the fact that I wear it or not doesn't mean anything, because the yellow ribbon is always going to be there, whether you see it or not, even if I wear it in the press conference, post-match, it doesn't matter, the situation doesn't change, there are still people in prison in an unfair way."